The processing of sensory information is something we all do. 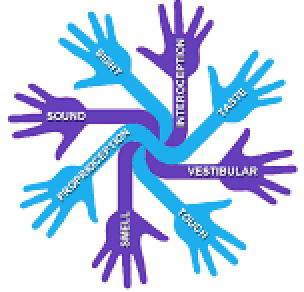 Sensory processing is the means by which we receive, interpret, organize and use the stimulation that activates our eight senses – hearing, sense of position/movement (vestibular), sense of body part position/movement (proprioception & kinesthesia), feelings of what’s going on within our bodies (interoception) touch/tactile, vision, taste, and smell. Each one of us is processing sensory information continuously, consciously and subconsciously. When sensory processing is effective we respond to life’s sensory events (both those related to ourselves and those within our surroundings) adaptively. When sensory processing is a problem, it may be related to the function of a specific sensory organ or sensory system, or it may be related to a neurologically-based condition known as sensory processing disorder, whereby sensory function is less than reliable to varied degrees. Stimulation may be poorly adjusted to, misinterpreted, missed, tuned into with heightened sensitivity, sensed as uncomfortable or adverse, avoided, craved, or inadequately filtered. Most frequently, with a sensory processing disorder more than one sensory system is involved and there is variability among the systems involved. Those with disordered sensory processing either must work harder to respond adaptively, or they experience problems that could manifest in many different ways because the processing of sensory stimulation is at the foundation when it comes to how we function. Awareness of sensory stimulation and individuals’ patterns of responses to basic sensory information is not only helpful, it’s essential in understanding and changing behavior and performance. 1. Sensory stimulation affects our physiology, psychology, emotionality, motor function, language, thinking, learning, interaction and development through our lifespan. 2. Reliable and sufficient sensory input is necessary for adaptive appropriate output. 3. Everyone tunes into sensory information his/her own ways. 4. How a person takes in sensory information naturally varies from day to day, and within the 24 hours of a day. 6. Sensory stimulation (aka our experiences) can affect brain change when provided with at critical intensity and frequency over a span of time, for better or worse. With brain change, sensory processing can change. 7. The chicken or the egg? Dysfunctional sensory processing can lead to other problems such as inadequate sleep, attentional limitations, anxiety, emotional reactivity and motor skill deficits, and in turn, problems such as these can affect how sensory information is received. 8. Stress can interfere with sensory processing. 9. Oftentimes if someone is feeling the need to protect him/herself from a certain type of stimulation that isn’t comfortable or tolerable, discrimination of the qualities of the stimulation ultimately suffers. 10. Sensory processing affects the value of repetition. Repetition, which is a valuable tool for learning, is not true repetition if the stimulation taken in and responded to is processed differently from day to day. 11. Sensory processing can affect our awareness of and thoughts about ourselves, as well as our awareness and interaction with others and our surroundings. 12. Sensory processing dysfunction can exist without a known cause, yet it can also alongside other conditions, such as autism, ADHD, ADD, prematurity, it often subjectively appears to be genetically related, and can also be related to trauma. Each occupational therapist at Pediatric Therapeutics is trained and experienced in the evaluation, treatment and management of sensory processing disorder. Interested in learning more about sensory processing disorder and other sensory based problems? Give us a call, or email info@pediatrictherapeutics.org and we’ll be in touch to answer your questions and direct you to resources.